It was just back on November 3rd when the Bureau of Economic Analysis (BEA), a division of the U.S. Commerce Department, declared that Gross Domestic Product grew at an annual rate of 3.5% during the 3rd quarter of 2009. Then on November 23rd, the Bureau declared that the revised rate of growth for the 3rd quarter was only 2.8%. The question that came to mind, right away, was: What exactly does this mean? First of all what it does NOT mean is that the economy grew at the rate of 2.8% during the 3rd quarter of 2009. The rate of 2.8% is derived by taking the rate of increase from the 2nd quarter to the 3rd quarter of 0.70% and assuming that this will stay constant for the next 3 quarters (0.70% times 4). Why is this a bogus way of measuring the economy? When I open my quarterly 401K statement and it reads that my portfolio has increased by 8.0% during the recent period, I don’t automatically assume that my annual rate of return is 32.0% (8.0% times 4). No, on the contrary, I look at the past four quarters to determine my annual return. If I lost 8.0% in the previous three quarters combined, and then gained 8.0% in the most recent quarter, then I am close to breaking even. But have I broken even? No. To demonstrate, let’s assume my portfolio was valued at $100,000 at the end of the previous fiscal year. After declining by 8.0% in the succeeding three quarters, the value had dropped to $92,000 ($100,000 times 0.92). Now, after gaining 8.0% in the most recent quarter, the value of my portfolio has increased to $99,360 ($92,000 times 1.08). You will note that I have yet to break even. I am in fact still down by 0.64% ($640 divided by $100,000) having started with $100,000 and declined to $99,360 over the past four quarters. So much for growth. Now back to GDP. Now when it comes to GDP, a more reasonable way to look at our present rate of growth, similar to measuring an investment portfolio, is to look at the past 4 quarters. Since the BEA only publishes figures in annual terms, I will approach this by using their figures, but keep in mind that the quarterly GDP figures are shown as annual amounts (in billions). Dividing the above by four, the average GDP over the past four quarters is $14,235.7 billion. The final GDP figure for all of 2008 was $14,441.4. So GDP has dropped by $205.7 billion ($14,441.4 minus $14,235.7) over the past four quarters. That equals a percentage drop of 1.42% ($205.7 divided by $14,441.4) since 2008. An even more accurate way to look at this is to start with the 2008 total GDP of $14,441.4 billion and to measure the decline over the next three quarters. In this respect GDP declined by 1.82% in the 1st quarter of 2009, by another 0.19% in the 2nd quarter of 2009, and then improved by 0.80% in the 3rd quarter of 2009. Overall GDP has declined by 1.21% since 2008. This is the statistic that’s most meaningful to me. GDP has declined at the rate of 1.21% since 2008. In dollar terms that’s $175.1 billion per year in lost production in our economy. That’s the equivalent of losing 3.5 million jobs paying $50,000 per year. That’s more meaningful to me than the BEA’s mumbo jumbo. 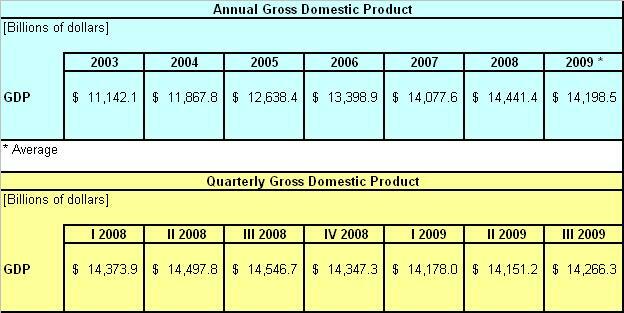 While we are at it, you will note on the chart above that GDP was $11,142.1 billion in 2003 and grew to $14,441.4 billion in 2008. That’s an increase of 29.6% over the six-year period, or an average of 4.93% per year. It also represents an increase of $3,299 billion in U.S. production over the period. That’s the equivalent of an increase of around 65.9 million jobs paying $50,000 per year. So wake me up when Obama’s economy killing policies have created 65.9 million jobs, or when GDP reaches $18,490.7 billion (an increase of 29.6% from today’s level), whichever comes first, but don’t bother me with meaningless government statistics. ← Give Me a Tax Cut, or Give Me Death!